It’s beginning to look a lot like Christmas #3: this is the best Christmas tree cow ornament ever! While our family was having Thanksgiving dinner at my friend’s Isabelle’s house and I was admiring her bull sculpture, I explained her husband the purpose of this daily cow blog. I told him cows are just everywhere around us, even in places you’d never think of seeing cows, including Christmas trees. After I mentioned I’ve spotted Christmas cow decorations in the past (there’s a big Christmas cow decoration right on my About page), Isabelle started to wonder if she actually had a Christmas tree cow ornament. Well, I guess she’s been working on her Christmas tree because this is the photo she texted me this afternoon. 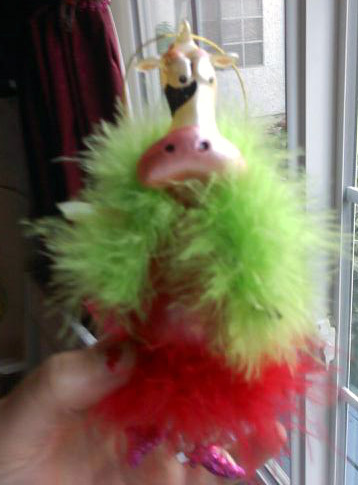 Oh my gosh, isn’t this the funniest Christmas tree cow ornament ever? Look at the poor cow’s freaked out eyes, the giant muzzle, the red and green boas wrapping up her body, and let’s not forget the glittery pink shoes! Previous Post Holy cow, a cowmedian! Dysmoophic cow, IMHO. I prefer the more real looking ones, like the Millie illustration on the right of the page. It does look very weird and quite scared. I can’t believe someone would come up with such a cow for a Christmas ornament. That’s the funniest part of it. And just in time for Cowsmas! Haha, I’ll have to remember that for my Christmas day post!